Based on our various travels to Africa, we feel the contrasting flora/fauna of Botswana and Rwanda offer among the most intimate wildlife experiences anywhere! UNESCO-designated Okavango Delta/Botswana is among the most important wildlife areas in Africa; including the “Big Five” (lions, elephants, cape buffalo, rhinos, and leopards), and outstanding bird watching. In stark contrast to Botswana, the Rwandan highlands provide the most intimate closeup with the wild: the gorillas of Rwanda. With only 10 habituated gorilla families, each can only be visited by a maximum of 8 people per day, in order to ensure a low human impact. Even our most seasoned Africa travelers consider the Rwanda gorilla experience to be their number one wildlife adventure activity! Upon arrival, you will be privately transferred to Vumbura Plains Camp. You will be transferred via light aircraft from Vumbura Plains Camp to Chief’s Camp. Upon arriving in Johannesburg, you will be assisted with your transfer to the Intercontinental Johannesburg Airport Hotel for your overnight stay in Johannesburg. Upon arrival in Kigali, you will you be met by our representative and taken to a local restaurant for lunch. Thereafter you will pay a visit to the sobering Genocide Memorial site before heading to the Bisate Lodge or the One&Only Gorilla’s Nest. In order to ensure a low-human impact on these extraordinary creatures, only 80 gorilla permits are issued daily. After breakfast, you will be driven to the park offices where you will meet your gorilla tracking group. With a maximum number of 8 people per group, this is a personal and sublime experience. To learn more about this incredible encounter, see our blog post here. After an early breakfast, you will embark on the second day of gorilla tracking to visit another gorilla family, each having their unique social dynamics. Following lunch at a local restaurant, you will be driven to Kigali Serena Hotel for check-in. The Vumbura area comprises two separate satellite camps, Vumbura Plains, and Little Vumbura, with Vumbura Plains being our preference. Each of Vumbura’s spacious “rooms” is raised off the ground, with indoor and outdoor showers and en-suite bathrooms. Other features include a private, small plunge pool and “sala” (a place to watch the passing of wildlife of the Okavango). Don’t be surprised to see elephants walking behind the tents and feeding on the trees. Each camp has its own raised lounge, dining bar – an area with truly amazing views of the Okavango Delta. Wildlife here is plentiful, including Impala, hippos, zebras, wildebeest, and crocodiles (+ amazing bird watching!) Similar to other safari lodges, Vumbura includes morning, afternoon, and night game drives, using 4×4 Land Rovers. If truly adventuresome, you may also request a nature walk (accompanied by an armed guide.) Being a “wet camp” gives you ample opportunity to explore the delta via the fun mokoro (dug-out canoes). 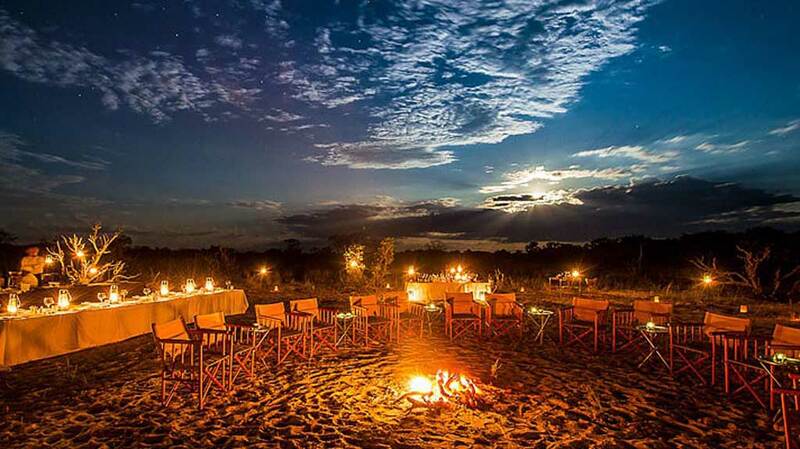 Please note that Vumbura Camp offers night game drives, unlike Chief’s Camp. Vumbura’s unique status as a private concession in partnership with the surrounding rural community (whose management was given by the Botswana government) allows for such a unique experience. Also note that hot air ballooning begins in April and ends in October, where guests have to opportunity to catch a bird’s-eye view of Vumbura Concession’s 60,000 hectares. By balloon, you venture to remote places of the concessions you would otherwise miss. Panning over the untouched plains and old island forests, leopards, elephants, serval, giraffes, honey badgers, wildebeests, and kudu are just some of the wildlife to be seen. A maximum of 8 guests is allowed on the hot air balloon, allowing for the utmost personal and private experience! Set in the Moremi Game Reserve, Chief’s Camp is made up of 10 1,500 sq. ft. luxury bush pavilions and one suite, all with private decks with plunge pools, as well as indoor and outdoor showers. We particularly like the pavilion’s polished teakwood floors, insect-proof netted windows and colorful batik fabrics. Other amenities include a new spa treatment room, a small pool, and picturesque dining area/observation deck. Based on the Chief’s location overlooking a large lagoon on the northwest tip of Chief’s Island, many mokoro (canoe/boat) game excursions are a continuing fun activity in the summer (!) Chief’s renovation includes 10 luxury bush pavilions (in effect like small cottages), all with private terrace plunge pools, 462 sq. ft. You should also very much enjoy the pizza lunches from camp’s new pizza oven (!). Situated close to Kinigi Park Headquarters, convenient for your morning gorilla trek rendezvous, the Bistate property covers 42 hectares (103 acres). Due to its location within the amphitheater of an eroded volcanic cone, the main areas and villas are perched atop the raised elevation of the slopes of Mount Bisoke (3911 meters or 12,175 feet), though often shrouded. Based on Bisate’s restorative conservation projects and real local engagement, the lodge has become woven into the local community. During the Bistate’s building phase, an amazing 15,000 trees were planted, with more planted each week. As part of your stay here, guests are encouraged to plant a tree in the lodge’s nursery before their departure. With only six suites (each 980 square feet), Bistate is one of Africa’s most exclusive luxury eco-lodges. Each suite includes an indoor shower, bath, and fireplace (nice on chilly nights!). The main lounge dining area and bar is the place to meet and reflect on the day’s gorilla experience. The in-villa massage treatments are a great way to relax after a day of gorilla trekking! Located in the foothills of the Virunga Volcano range, we are excited for the October 2019 opening of the luxury One&Only’s Gorilla Nest Lodge. With 21 rooms and suites, it will be much more conducive to larger family groups interested in the intimate Rwanda Gorilla tracking experience! Each room/suite includes an indoor shower, bath, air-conditioning, gas fireplace, TV, and covered outdoor terrace areas. Other amenities include a main lounge, dining area and bar, as well as a luxurious spa! Though we only have artist renderings at the moment, we are excited to see the finished product!